Hope's Cafe: Whirl-A-Style Makes Hairstyling Easy! Giveaway!! I don't know about all of you, but there are days when I just hate my hair. Although deep down I really do like my long hair, and wouldn't cut it for anything, at times it gets so annoying! Trying to exercise, or play sports for example...I have tried every style imaginable. Ponytails still swing down in my face, braids can hurt if they hit you the right way while doing those jumping jacks, and buns give me a headache after just an hour or so. So needless to say, I was thrilled when I discovered the Whirl-a-Style! The Whirl-a-Style is a simple little piece that makes taming your hair super-easy. It is available in different sizes for different hair lengths and textures, so you're sure to find one that suits your need. I received a black Whirl-a-Style, and gave it a try right away. At first I couldn't get it to work right, and nearly gave up in despair :) Then I noticed the paper suggested that newbies try putting their hair in a ponytail first. (Duh, read the little paper included!). 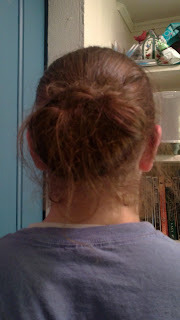 After that, it was a quick fix to get my hair neatly arranged in the perfect bun. I waited for the headache to kick in, since no matter what clip, pins etc. I use, I end up having to pull it down within a couple hours. To my amazement and joy, I wore my hair in the Whirl-a-Style all day! And no headache! I was also impressed because the bun lasted through an intense, hour-long racquetball match, my daily aerobic exercise, and our family's almost-daily, rowdy volleyball game in the backyard. Here's how my hair looked at the end of the day. Not perfect, but still neatly contained and out of my face! As you can see, the Whirl-a-Style does a great job. There are many other hairstyles you can do with this little piece, which I am going to try out too. This is something to make all your bad hair days go away! One of my readers will receive their own Whirl-a-Style! I'm interested in the Klicinz. I like the Large Whirl a Style in Black. entered Olasonic speaker, accordian wallet, and zvox. Entered the 100% pure Golden Peach Concealer giveaway.